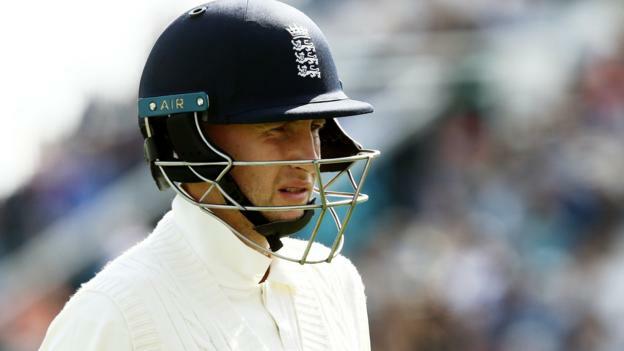 Ex-England opener Geoffrey Boycott says the Test team have “gone backwards” and called their batting “rubbish” after another collapse against India. India, who cut England’s series lead to 2-1 with a 203-run win at Trent Bridge, had the hosts 86-6 on day one of the fourth Test at Southampton. Sam Curran’s 78 helped England to 246, before India reached 19-0. After England chose to bat, Keaton Jennings suffered a horrendous fourth ball lbw dismissal in the third over. Root and Jonny Bairstow also fell cheaply. England have made 100 or fewer at the loss of their fourth wicket in 32 of their past 63 innings, over the past three years. They have gone 15 innings since last making 400, against Australia in Melbourne in December. It needed a career-best from Curran – left out of the team at Trent Bridge – in a partnership of 81 with Moeen Ali, who made 40, to help them to 246. “Cook’s form is getting worse, not better; Jennings is not cutting it,” Boycott said. “We have dropped our young kid at four, Ollie Pope. We are no further forward in finding batsmen. The selectors would be better at county matches trying to find somebody. “It’s puzzling because they have a batting coach – I’m not just blaming [Mark] Ramprakash – but they have a head coach [Trevor Bayliss] who is supposed to be a batsman – he played for New South Wales. And you wonder what they are doing. Former England captain Michael Vaughan said number eight Curran, who has made 225 runs in his first five Test innings, is the “best technician” in the England side this summer. “He looks naturally the best defensive player that England have had in this series,” Vaughan said. “The rest of them still jab at the ball even in defence. “Alastair Cook looked OK but he is a concern for me at the top of the order. I still don’t think he looks in. “When he is in quality form, it’s the mind that plays so well and it has always been so strong. To see him deflect it to third slip, like fielding practice, I’ve not seen that from him. Surrey all-rounder Curran, 20, in only his fourth Test, said: “I was disappointed to miss out on the last Test but you can’t drop someone who has got a hundred [Chris Woakes].